The Original® Glove from Mechanix Wear is a long-standing favorite due to its versatility and high standard of protection. This version of the glove comes in MultiCam®, making it ideal for tactical and outdoor applications. It is made from TrekDry® material, which fits snugly against the hand and manages temperatures for cool, comfortable long-term wear. The palm features a single layer of synthetic leather, improving grip while maintaining the flexibility needed for fine tasks. The gloves fasten using a TPR hook-and-loop closure that fits tightly around the wrist, improving insulation and preventing debris intrusion. 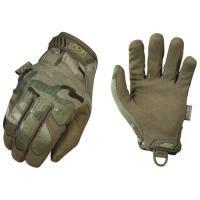 Mechanix Wear includes nylon cord loops that allows for hanging of the gloves for convenient storage.